St. Martin's Griffin, 9780312590970, 336pp. 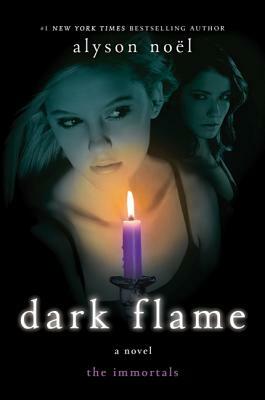 In Dark Flame, Alyson Noël's most darkly seductive Immortals novel yet, Ever fights for control of her body, her soul—and the timeless true love she's been chasing for centuries. At the same time, Ever delves deeper into dark magick to free Damen from Roman's power. But when her spell backfires, it binds her to the one guy who's hell-bent on her destruction. Now there's a strange, foreign pulse coursing through her, and no matter what she does, she can't stop thinking about Roman—and longing for his touch. As she struggles to resist the fiery attraction threatening to consume her, Roman is more than willing to take advantage of her weakened state…and Ever edges closer and closer to surrender.